For growers wanting maximum yeilds but still at a budget price. 2.9.. Perfect for the beginner or for anyone wanting to grow their own produce indoors. 1m2 400W setup con..
Seahawk 1.0 x 1.0 Tent 2 X Allvent A-40 Fans 5M 100mm Duct 400W HPS Light kit. 2 X 15L pots with sau.. Perfect for small vegative plants or mother plants. 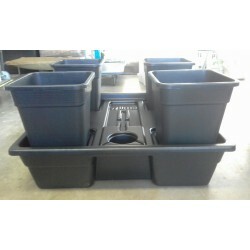 Ideal for small herbs or crops that dont require.. Perfect for vegative plants or mother plants. Ideal for small herbs or crops that dont require HID l.. Perfect for propgation and seedlings. Fits larger humity cribs or 2 standard heat and grow cribs. cl.. Perfect for the beginner or for anyone wanting to grow their own produce indoors. 1.45x1.45x2m..
A quick clean way to dry your favorite herbs complete with full odour control. 100% smell proof! For..
1.2 x 1.2 GreenPower Tent with Electronic ballast, Carbon Filter Odour control and Nutrients. .. Perfect for the beginner or for anyone wanting to grow their own produce indoors. 2.4.. Perfect for the beginner or for anyone wanting to grow their own produce indoors. 1.2 x 1.2m2 600W s..
1160 x 1160 Flood and Drain tray. $175 Flood and Drain fittings. $28 200L reservoir. $135 Top up flo..